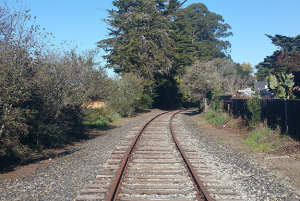 The Santa Cruz Branch Line is an active short line railroad that travels through Santa Cruz County along a right-of-way (ROW) of varying width between Pajaro and Davenport. The RTC is responsible for maintaining the portion of the ROW outside of the railroad easement, which is defined as a 10-foot lateral width in each direction from the railroad centerline. The short line railroad operator, Saint Paul & Pacific Railroad, is responsible for maintaining the infrastructure within the railroad easement. The Federal Railroad Administration (FRA) imposes safety requirements for any activity within 25 feet of the centerline of track. The RTC has a Preventative Maintenance Program that outlines procedures for RTC staff to carry out maintenance operations, with individual inquiries being tracked using ArcGIS, a mapping and analytics platform. Regular inspections and repairs to the infrastructure within the ROW will maintain the corridor for future use and limit impacts to adjacent jurisdictions and private property. In addition to regular inspections by staff, community members can report maintenance needs by calling the RTC office or emailing maintenance@sccrtc.org for matters such as damaged rail equipment or homeless encampments. Please include your name, request, and location description. Do not enter the rail corridor right-of-way to investigate any matter yourself. Access to any part of the ROW requires permission from the RTC and the short line railroad operator through a right of entry agreement. Once the RTC receives a report, it is entered into our tracking system and a ticket number is assigned for reference. Individuals who submit reports of maintenance needs to the RTC via email will receive a reply email with their ticket number, which can be referred to for future status changes and resolution. The RTC requires a crossing agreement for new underground and overhead utilities that cross the Santa Cruz Branch Rail Line right-of-way. The lead time for a crossing agreement is typically 4 to 6 months. It is important to contact the RTC well in advance of planned access in order to allow sufficient time to execute the agreement and make the necessary notifications. Any utility or other construction work that traverses the railroad infrastructure or is in the vicinity of railroad infrastructure within the Branch Line ROW must conform to the American Railway Engineering and Maintenance-of-Way Association (AREMA) standards.